Off Piste Skiing - which Ski and Boarding policies cover you? As they progress, many skiers and boarders want to venture beyond the piste ropes or markers - but which companies offer cover that will continue to protect you beyond the prepared slopes? We have summarised a few policies from around the market - some are pretty restrictive, others much more liberal - in fact with one you are fine on or off piste, with or without a guide, inside or outside resort boundaries, as long as you take reasonable care and do not ski against guidance. Almost all policies around cover off piste with a guide, although with some companies you need to ensure that you stay out of hazardous areas, or on the pistes whilst avalanche warnings rise above 2. But, as you can see, some companies go further. Most of these require you to take out the Winter sports or Skiing option in addition to your travel insurance policy. Cover with or without a guide. Only in areas designated safe by resort management. MPI Brokers have negotiated with underwriters that there is no such exclusion or limitation for off piste skiing. There is,however, a general requirement, common to all insurance, that policyholders behave in a reasonable and sensible manner. Cover for off piste skiing/snow boarding is restricted within resort boundaries. Some policies also require adherence to the FIS Code of Conduct, published below. Respect for others. A skier must behave in such a way that he does not endanger or prejudice others. Control of speed and skiing. A skier must ski in control. He must adapt his speed and manner of skiing to his personal ability and to the prevailing conditions of terrain, snow and weather as well as to the density of traffic. Choice of route. A skier coming from behind must choose his route in such a way that he does not endanger skiers or snowboarders ahead. In other words, the skier in front/below always has priority. Overtaking. A skier may overtake another skier above or below and to the right or the left, provided that he leaves enough space for the overtaken skier to make any voluntary or involuntary movement. Entering and starting. A skier entering a marked run, starting again after stopping or moving upwards on the slopes must look up and down the run to make sure that he can do so without endangering himself or others. Stopping on the piste. Unless absolutely necessary, a skier must avoid stopping on the piste in narrow places or where visibility is restricted. After a fall in such a place, a skier must move clear of the piste as soon as possible. Climbing and descending on foot. Whether climbing or descending on foot, the skier must keep to the side of the piste. Respect for signs and markings. A skier must respect all signs and markings. Assistance. At accidents every skier is duty-bound to assist. 10.Identification. 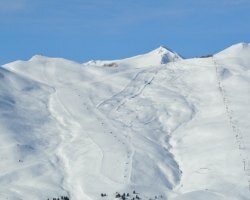 Every skier and witness, whether a responsible party or not, must exchange names and addresses following an accident.